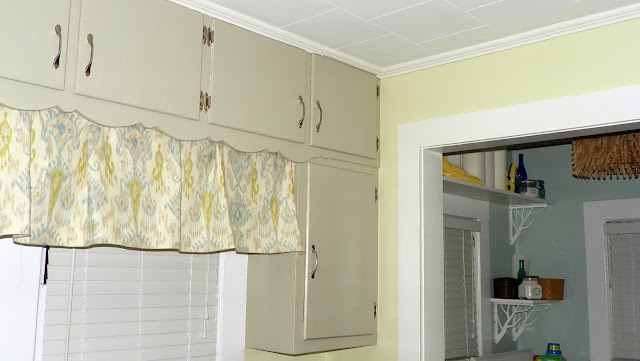 Our kitchen still has the original cabinetry from 1941, complete with a scalloped wood valance and super unattractive florescent light fixture with bare bulbs mounted underneath. Okay, so I'm not sure if the light fixture is from 1941, but the unattractive part is true. 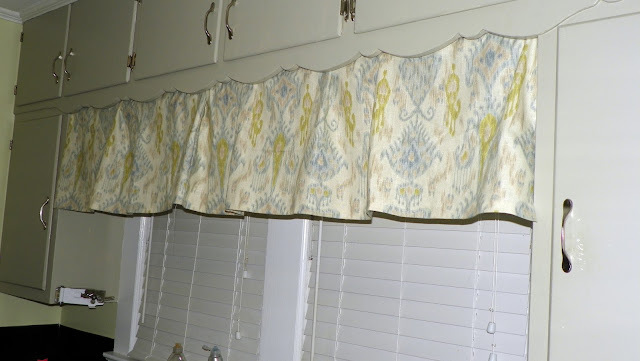 I wanted to make a curtain to hang across the span to tie my laundry and kitchen rooms together but mostly to hide that ugly light. I purchased a remnant piece of ikat fabric from a local fabric outlet a while ago, liking the pattern and colors, but not having anything specific in mind for it. Well, turns out the colors are almost exactly the same as the colors in my kitchen/laundry area, so I decided to use it to make my curtain. I started with my curtain "rod"... 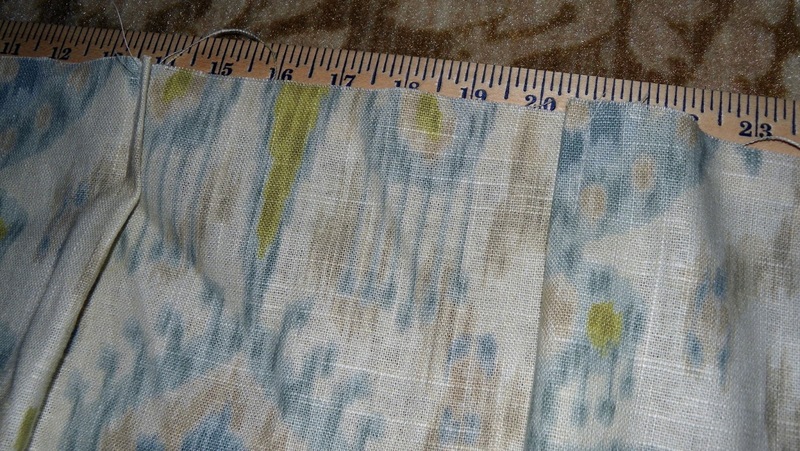 I used 2 yardsticks that I purchased in the paint department of Lowe's for $0.69 each. I didn't measure before I bought them but luckily, my span was exactly 6 feet, so the two together were the perfect size. 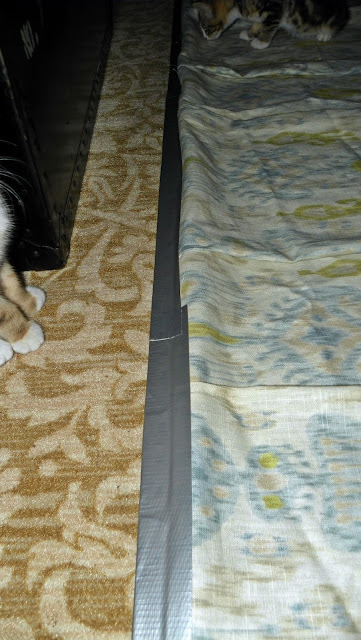 I duct taped them together in the middle (I know, you're staggered at my highly technical process of joinery) and then laid my fabric across it. 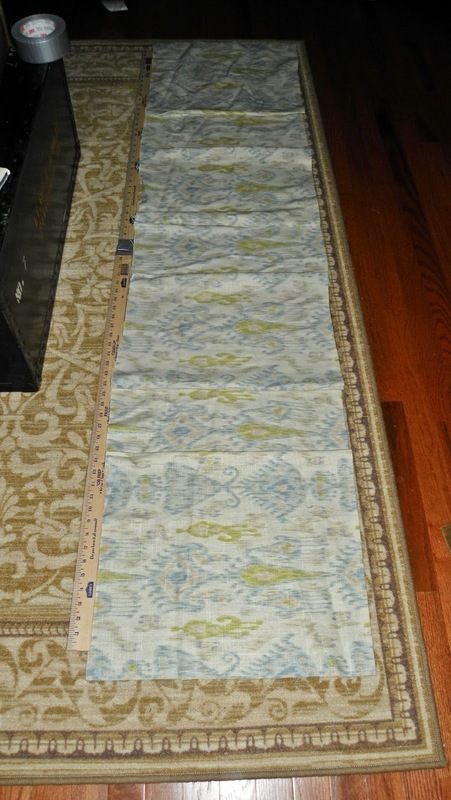 It worked out great that these were yard sticks because it made it much easier to find exact measurements for where I wanted to put my pleats. I want to preface this part by stating that I am NOT a seamstress. 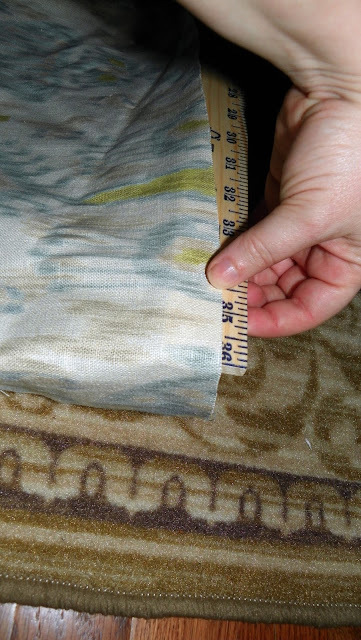 I am very inexperienced with sewing machines and sewing in general, so I only attempt the simplest of sewing tasks. So if I can tackle this, anyone can. I started by cutting a width of fabric from my remnant... long enough to be a little longer than my yardsticks so I'd have enough to do a few pleats and sew the hem. I sewed a bottom hem along the entire length of the fabric. 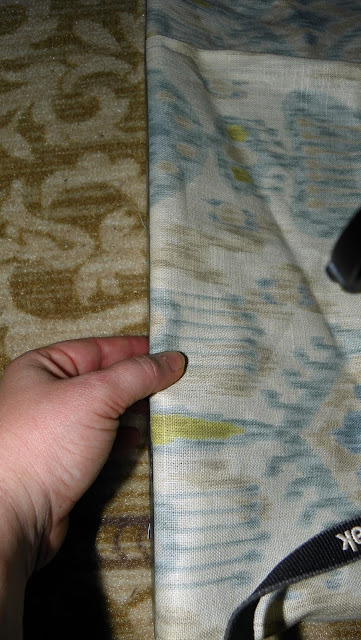 I started from the middle and worked my way out 3 inches on either side to find my pleats... and did the same at the halfway mark on each yardstick, folding a small section inward, so there are 3 sections of pleats all together. 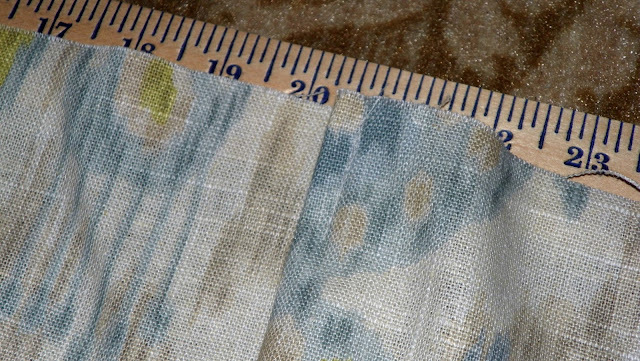 Once I had them pinned, I sewed them down a little bit so they'd stay in place so I could attach the curtain to my yardsticks. 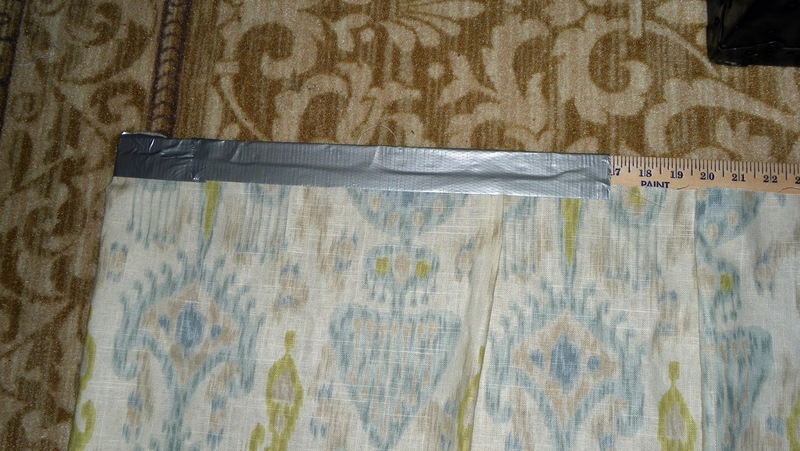 Once I had it all measured and sewn down, I got all technical again and started attaching the curtain to my yarrdsticks with duct tape. 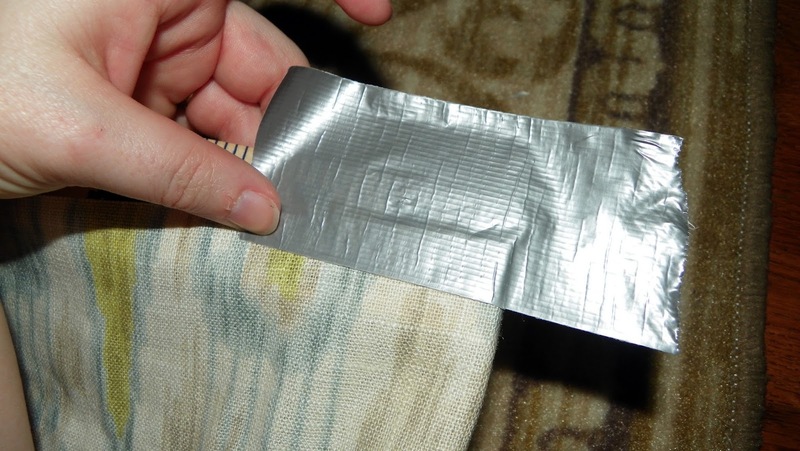 I started with the edges and simply folded them over and taped them to the ends. Then, I just started adding duct tape all along the top edge to attach the entire length to the yardsticks. 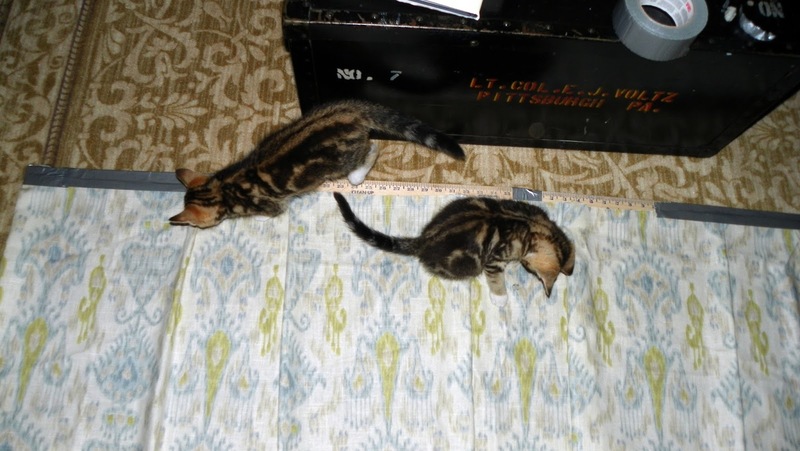 The next step (and this is very critical to your progress) is to have your work thoroughly inspected by two very curious kitties. Once the inspection was complete, I finished taping. 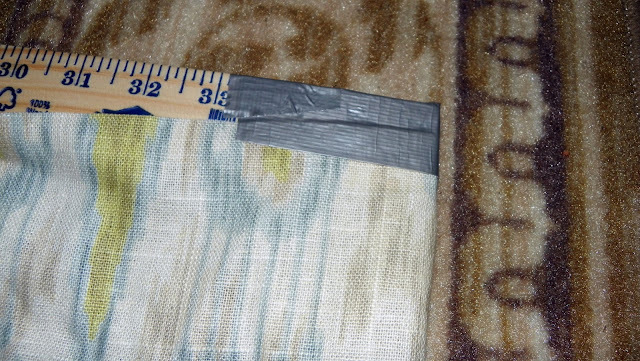 Next, I just folded the taped side under so all you see is the fabric side. 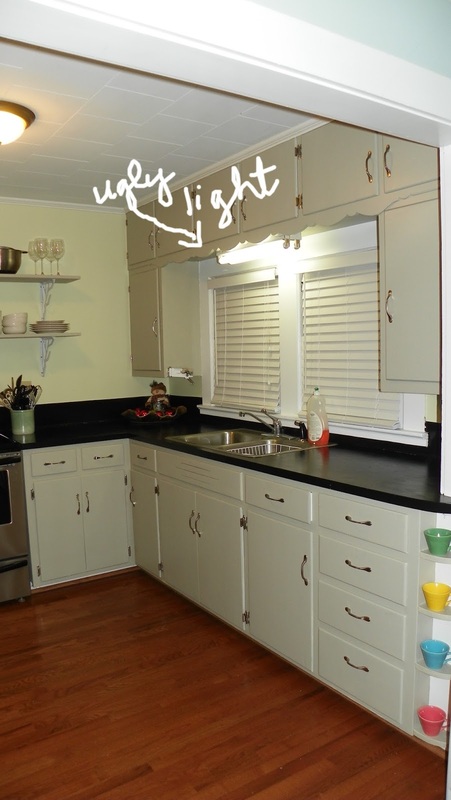 My plan was to then attach it to the back side of the scalloped edge of my cabinets with screws to hold it in place. However, when Daniel put it up there, the fit was so tight that it stayed all by itself with no support. So, we said 'all's well that ends well' and just left it up there like that. It may come crashing down on our heads one day, but for now it seems pretty secure. *Update: The curtains came crashing down on our heads. More than once. So, I finally got Daniel to put a couple nails in it and it has since held fine. No more ugly light fixture! You can kinda see in this picture how it ties the colors of the two rooms together nicely. 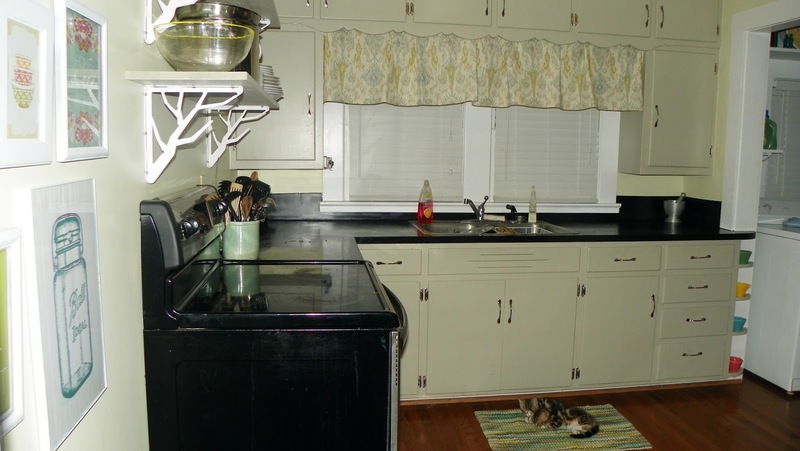 And I'm still seriously thinking about painting the kitchen again (for the 3rd time) the same blue that's in the laundry area. 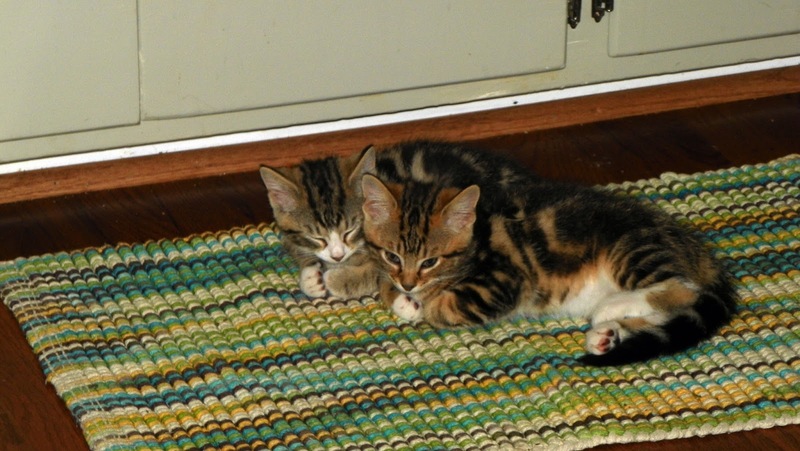 Bob & Leon were exhausted from all their inspecting. They needed a nap after such a hard day. Adorable! I love the material and great ingenuity. After reading this step-by-step guide I'm confident that I can also make curtains for my kitchen. 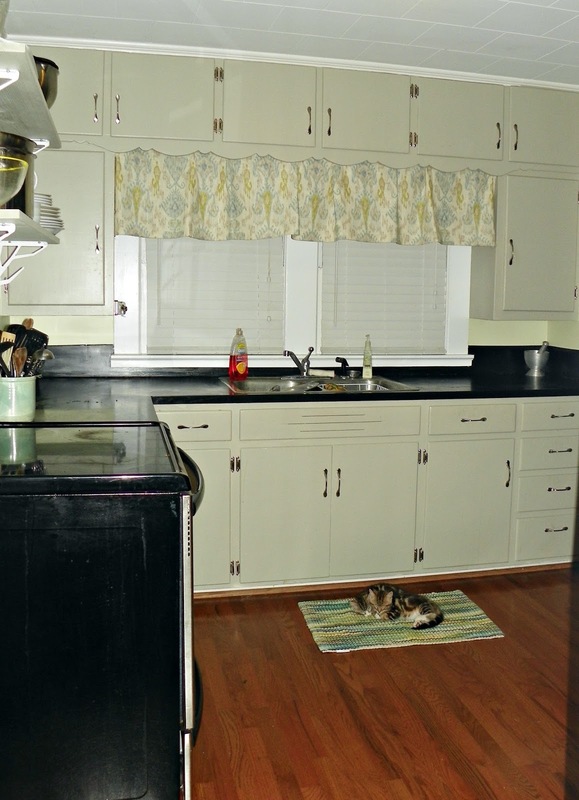 Kitchen seems to be the most difficult part of home, when it comes to decorating the place. I admire your creativity very much that you choose awesome fabric and made attractive curtains for your kitchen. 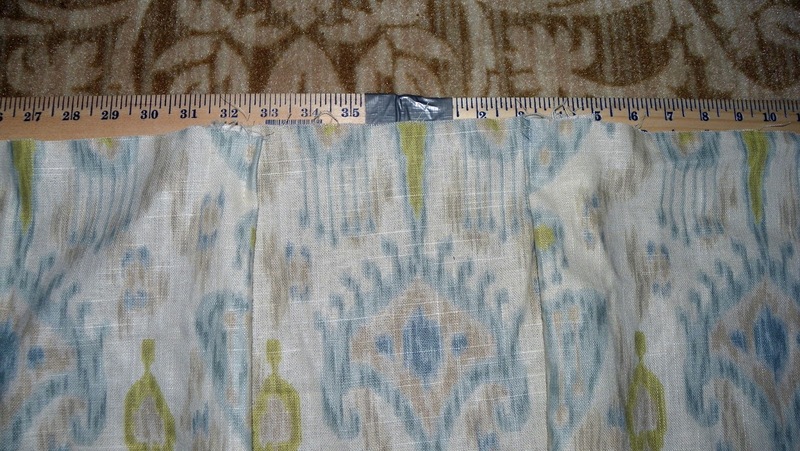 Now, I have beautiful fabric from curtains and blinds in Perth and above instructions would be helpful for me to making kitchen curtains. Great !!!!! I like this kitchen curtains pics. With this curtains our kitchen are looks like very good.